Amber Heard certainly seems to have an affinity for playing the film noir types who elicit little more reaction than the understanding that she is little more than a pure representation of the male fantasy. Heard has done this for years whether it be in Drive Angry or Machete Kills, but in London Fields we are operating in a film that is actively trying to become a member of the noir genre rather than riffing on it. 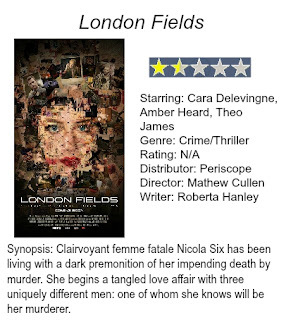 In London Fields, Heard plays a character who is clairvoyant and a total femme fatale named Nicola Six. Seriously. All of that is true. Nicola is a seductress by way of having lost her parents at a young age and making up imaginary friends that automatically tells us she is tormented and taking it out on every man she encounters with her natural gifts from God. She enjoys playing this role to large effect with her many worshipers. Nicola's exploits are made all the more heightened by the arrival of Billy Bob Thornton's writer in a London that is on the brink of nuclear war. Thornton's Samson Young is looking to write a new novel when he stumbles upon Heard's Nicola who just so happens to live in the same building he's staying in. It always feels like a risk including a writer in your film as it easily sets one up for more direct criticism than the film might receive otherwise, but while London Fields recognizes this possibility and even addresses it to a certain extent the somewhat interesting ideas at play here are still not able to convey themselves as a good movie. At all. In fact, this is pretty terrible all-around. With the arrival of Thornton's Samson whose intention is to write a new book, but look around to find inspiration we know he'll quickly stumble upon interesting characters and the first of them just happens to be his cab driver, Keith Talent (Jim Sturgess), who never drives a cab again in the movie after this first instance. Keith takes Samson down to the local pub where he introduces him to a few of his friends including Guy Clinch (Theo James) just before Nicola walks in and all the men stop to watch her walk through to the bar. It is immediately clear to Samson there is a competitive edge between Keith and Guy for the attention of Nicola despite the fact both are married with children. It is only after this introduction that we learn Nicola lives just above where Samson is staying. In light of the impending war in London people have begun deserting the area and Samson has traded his place in Brooklyn with another, seemingly much more famous author by the name of Mark Asprey (Jason Isaacs). After seeing Nicola clean out a large portion of her apartment Samson follows the femme fatale and goes through her trash to discover that this exotic flower is not only clairvoyant, but has been living with a dark premonition of her impending death by murder. Samson has found his story and begins to piece it together as Nicola entangles herself in a love affair with three uniquely different men: one of whom she knows will be her murderer. Apparently this mess is based on an actual novel by Martin Amis and I'd be interested to know if the tone of the book is anything similar to this or if the thick plotting plays out any better than the way Roberta Hanley's script cobbles together multiple strands to barely make any of it coherent. What is even stranger are the amount of extraneous characters at work here and the rather impressive casting job that's been done with them. Besides the leading roles that are taken by the aforementioned Heard, Thornton, Sturgess and James there are roles here for Jaimie Alexander, Cara Delevingne and Johnny Depp that ultimately add little to nothing to the proceedings. It is beyond confusing what some of these typically well-regarded actors saw in a script such as this or if Cullen's pitch made it sound as if he planned on doing something truly experimental. Were the project to have had that appeal I could see how some might be interested as actors really have no control over the final product, but this seems strange even for those you'd normally expect to see in a smaller side project. Cullen is a music video director working on his first feature film and you can see this influence throughout as the editing is rapid and the colors vibrant, but why this much talent was attracted to such a tepid story and even more how they were wasted on such a vapid film is beyond me. The worst offender here is Sturgess though, who is trying so hard to create a character and overacting so much that I literally cringed any time the guy was on screen. The worst part of the film though is simply how lifeless it feels and how cheap it looks. The film legitimately comes off like a bunch of adults gathering together to play dress-up and walking around with ridiculous clothes, over-the-top accents and making complete fools of themselves for what feels like forever. The film just keeps going on, attempting to throw one twist at us after another and none of it seems like it makes much sense, but worse we don't even care to try to put it together. The only interesting way to look at the film and what might have made it more bearable is the idea of purposefully playing on the archetypes of a crime novel so as to play on the tropes of the genre given the writer is technically intertwined in the story. When your story consists of little more than a love triangle and a dart competition you should know already that you're in trouble and there's probably no helping your picture. It's too bad London Fields is as terrible as it is because it has enough solid credentials to have made something more than decent, but there is no rescuing what I saw, not even if you were to cut everything involving Sturgess. It's that bad.